The preeflow® story of success goes ahead. preeflow® participated at Nepcon exhibition in Bangkok together with our distributor for Thailand area. Thailand has an increasing market for electronic manufacturing and automation. The company CHEMTEC is, besides other technical products for automation, the official distributor for preeflow® and ViscoTec. 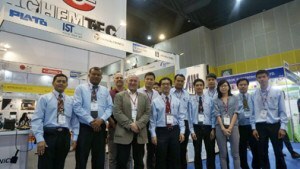 As Chemtec has moreover 20 years of experience in dispensing they are well known in Thailand market. With more than 15 sales and service staff they will become to a strong partner for eco-PEN family in future.